You Can Run a Marathon! 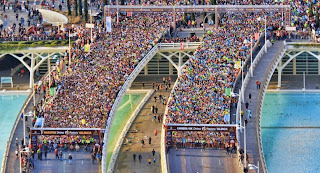 : 31st Edition of Valencia Marathon 2011!! I stopped my watch after marathon distance (I was only at the 40k marker when my watch said 42.2k) and it said 4 hours, 21 minutes and 13 seconds. It's the 'official' time that counts though. MY VALENCIA MARATHON FINISHING VIDEO (around 1 minute in) I look finished quite literally!! On marathon morning I woke up, had some breakfast and an espresso. Then I put on my usual Running Copenhagen orange t-shirt, black shorts and pink trainers. At 8.30am I made my way to the start line 10 minutes away. The weather was around 12 degrees with some light cloud. I didn't like the look of it as I could see that the sun would be out later! Once at the start line I queued for the toilets and took in the atmosphere. It was fantastic, even better that Copenhagen Marathon. There was a 10k race starting at the same time as the marathon. 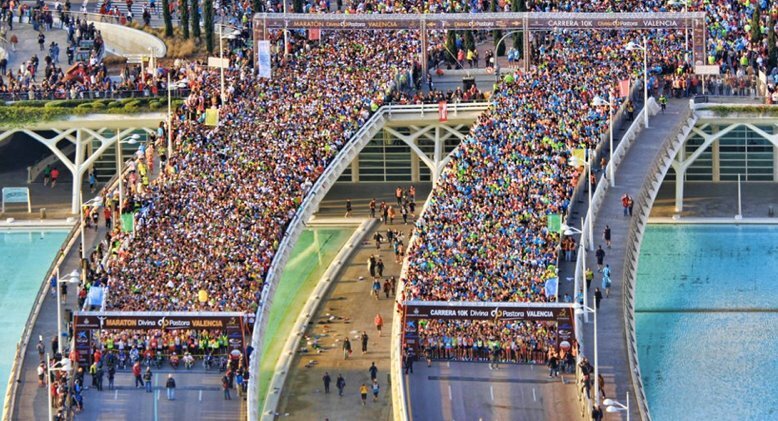 The marathon runners were starting on one side of the bridge and the 10k runners were on the other side. We would run around the first 4k together but on different sides of the road. I started almost at the back and then heard the fireworks which meant the marathon had started. It was much quicker to get over the start line and only took 4 minutes. In my interview at the 3k point I told him that I wanted to run a marathon in every city in Europe before the age of 50! I really enjoyed running with all these people but started dropping back from them at 19k. This was when the weather started getting a lot hotter!! I did the same as I did during Copenhagen Marathon which was to walk through all the water stops. Valencia had better stops in some ways and worse in others. The water was in a bottle so you could run with it and take sips all the way until the next stop but there was only water there. No oranges! No bananas! No energy drinks! From 20k onwards I started taking 2 bottles, 1 to throw all over me and 1 to drink. I was very glad that I had 9 energy gels with me this time instead of just 6. From 7.5k and then every 5k (12.5, 17.5, etc) there were 'firemen?' hosing the runners down with water if they wanted it. I ran through everyone of these and enjoyed being cooled down, if only for a little while. I started really beginning to struggle with the heat from 28k onwards. By then the temperature was around 20 degrees. It was around 22 degrees when I hit the 38k marker. I just looked at the green marathon line on the floor, listened to some Justin Timberlake and kept on running! I had planned to only walk at the drinking stations but at 38k I walked for a minute and just took my extra energy gel that was for emergencys! Just before I started to run on the platform on the water I got the crowds on either side to cheer really loud for me :-) That was a great moment! It was like I was in front of everyone and was about to get my gold medal!! Once I crossed the line I was so happy! It was a harder run than Copenhagen had been simply because of the sunshine. I always knew if the sun came out I might be in trouble. I hadn't expected the weather to be quite so hot as everything I had read said it would be between 12 and 17 degrees. very interesting reading. Well done for finishing it so well!! A marathon in every city?? you must be crazy! think you have caught the bug! haha :) but we'd happily cheer you on in barca!! 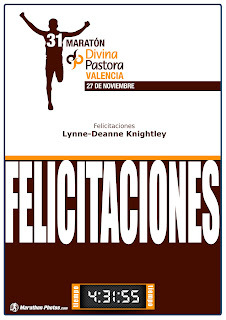 Congrats and a great race report! The guy doing interviews sounds really fun. Everybody looked very HOT and beat at the finish (not like CPH at all!). Amazing that you PRed even so. With cool temps you probably would have been 10-15 min faster. Do you only carry one gel? I only count on water during races and take 6 gels ...never know what kind of gunk they might serve you...but in the heat I'm not sure anything would have helped..hard to eat when it's hot too. The start looked HUGE. Amazing it only took 4min to cross the line. I think Berlin will make that look like a small race though! Looks like a great city race! 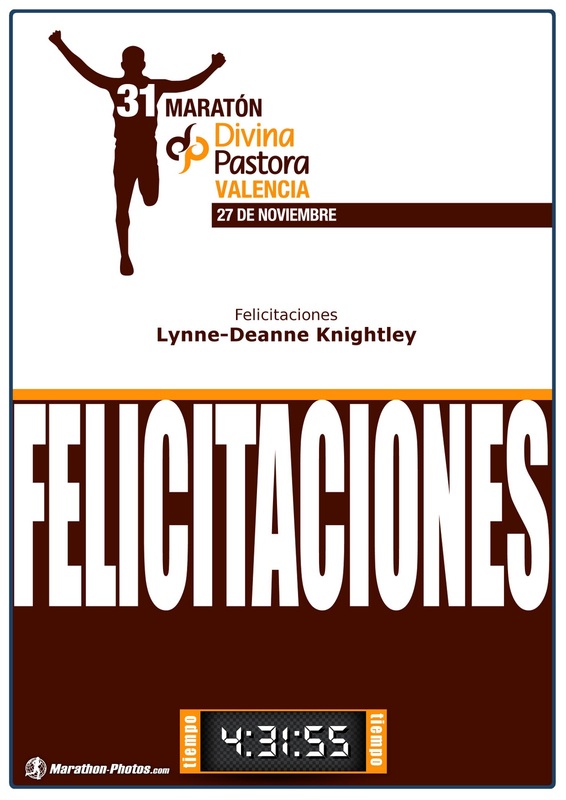 It was a great race and I recommend it! !